This cute plush cow ready for countless hugs! 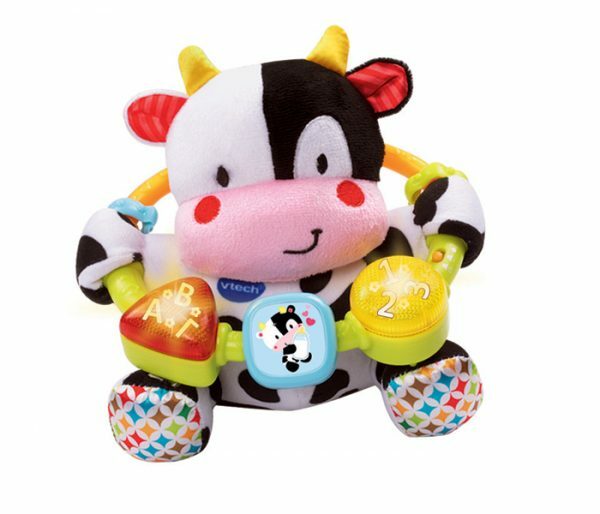 The cow’s one of the most recognizable and beloved animals of young children is the most imaginative way to learn the baby’s first words, letters, numbers and much more in Greek!. It has a plastic ring that has been designed to be easy to hold for tiny hands. The two bright square buttons will introduce the baby to the Greek alphabet numbers the colors and animals. At the same time the your little one will hear fun phrases, songs and melodies that will prompt the child to say their first words but also to sing. Baby can learn about the cause and effect by tapping the bright square buttons, encouraging them to develop their kinetic skills at the same time. It includes 12 cheerful melodies and 3 songs in Grekk that will sing the baby along with mom’s help.